First I would like to thank Swathi for giving me this opportunity to suggest bakes here at Baking Partners. Lets face it I am safe baker I prefer tried and trusted recipes, and a lazy baker for I hardly open the books I buy for baking (or cooking for that matter) for that matter take up elaborate recipes. Now at Ahmedabad airport I had picked up The BBC Good Food Issue for two reasons one it was a vegetarian one and two there was a Gordon Ramsay recipe featured. Boy was I excited! Hardly sat in the plane and that was the first page I opened, but sadly will never make it as the recipe calls for phyllo sheets , something we do not get here and I have no patience to make the sheets. So I just kept the magazine on the kitchen side shelf. I did not think I will use the magazine at all. Then at work I saw Swathi’s message asking me to suggest bakes. I just casually mentioned savoury bakes like tarts, scone I was surprised when Swathi asked to make two. Then I realised that at the back of my mind I had these two interesting recipes that I had noticed in the same magazine. These scones are very simple and the only complaint against them at home was why only 8 pieces or rather make one more batch ! The original recipe asked for fresh sage 10 leaves, 2 chopped fine and rest whole. I used dried sage. The original recipe says baking time is 12-14 minutes I need 20. 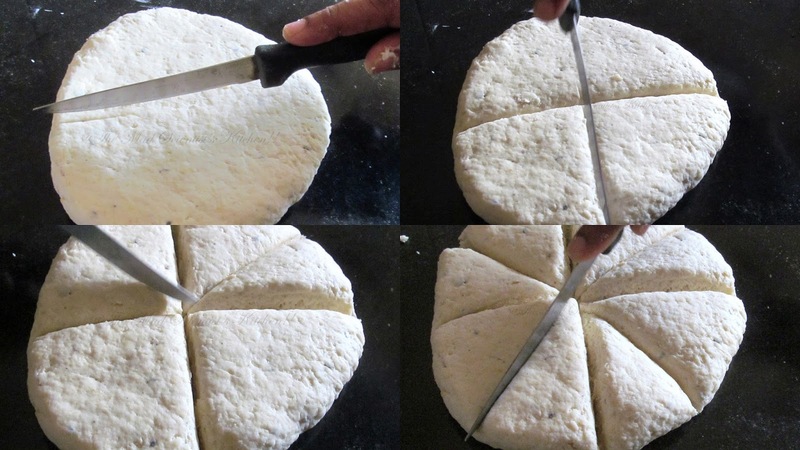 Also you can roll the dough out in a square then cut it in quarters then the quarter in can be cut diagonally to get 8 triangles. I suggest you shape out the dough in the tin or the tray you want to bake the scones. My scones went a bit wonky as I was transferring them. Grease and flour the baking tin. Whip the curds and measure. 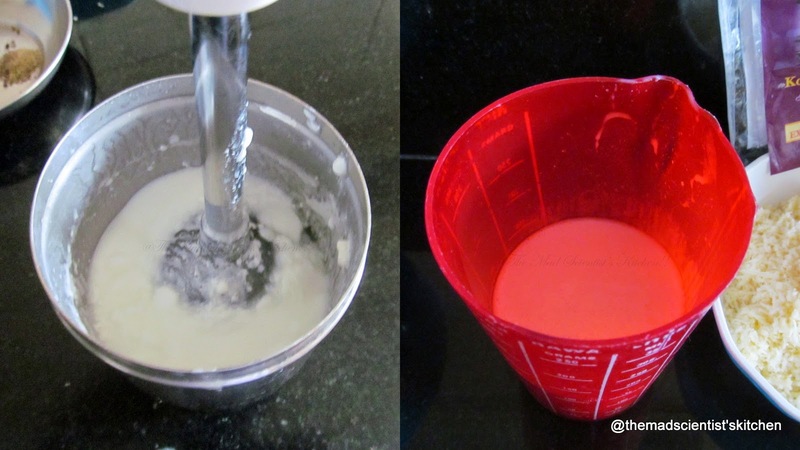 Adjust the water and whip it to get a smooth mixture. This will give you 150ml of buttermilk. 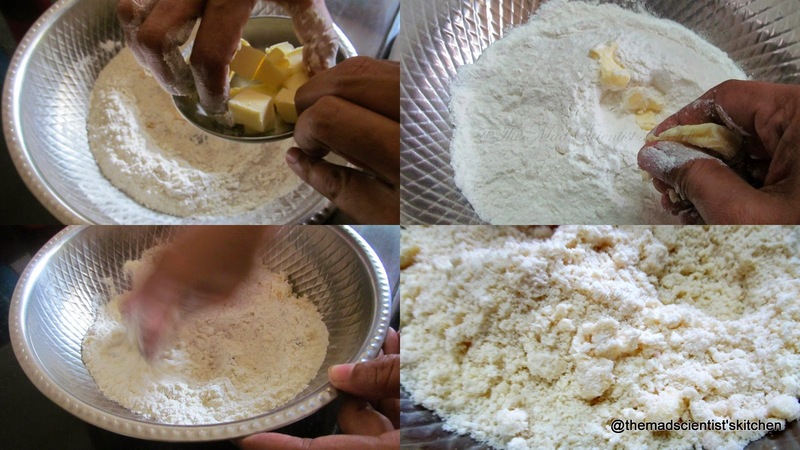 Mix flour, mustard powder, salt, pepper in a bowl. Stir in ½ the cheese and 1 tblspn sage. 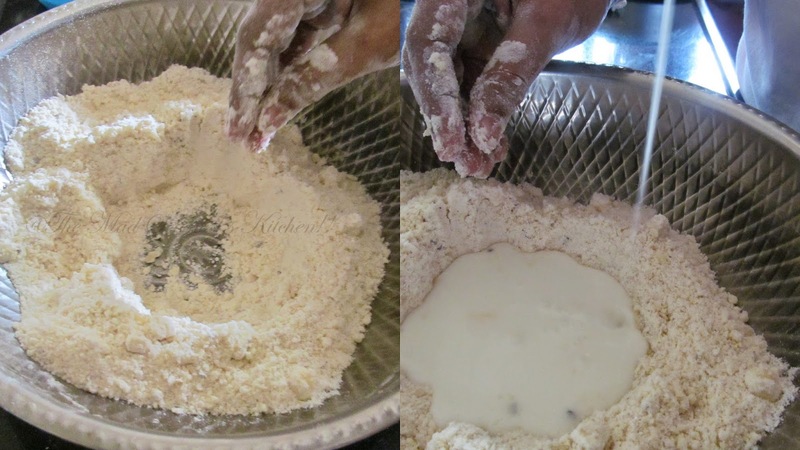 Quickly stir and mix well till the mixture forms soft and spongy dough. Roll in to 3 cms thick circle. Cut in quarters then the quarters again to get 8 sectors. Transfer to a baking tin. Sprinkle the remaining cheese and top with sage. Bake for 20 minutes until they are well risen, golden and sound hollow when tapped on the bottom. 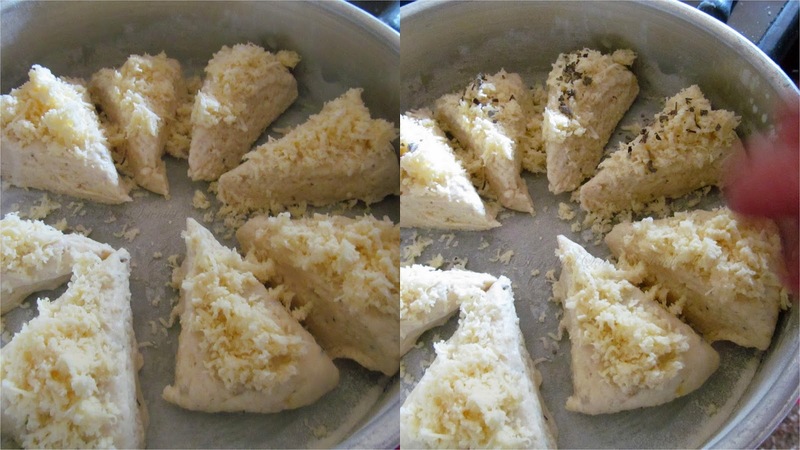 I could not resist cutting it to see the if the scones were spongy! Thank you for the challenge Archana, sorry for the confusion. Have updated my post with ur name and link. Thank you for pointing out dear.